A Swiss-headquartered private equity firm has been selected as preferred bidder for 80 Fenchurch Street, EC3, a prized £300m development opportunity in the heart of the City insurance district. Partners Group is under offer to buy the 0.6-acre site out of receivership for well over £50m, with exchange expected imminently. Eighty Fenchurch Street has planning consent for a 245,182 sq ft Foster + Partners-designed office building. It is being sold by receivers at Allsop who were appointed by Ireland’s National Asset Management Agency in April in conjunction with previous owner Shieldpoint, an Irish investor and developer which originally assembled the site. Partners Group saw off intense competition for the opportunity from a long list of interested parties, including Tishman Speyer, Russian developer BFA and a joint venture between Core and Starwood. The firm, which has 18 offices around the world, including a base in London, has €6bn (£4.7bn) of property under management according to its website. While Partners has a track record as a direct owner of real estate globally, it is best known in the UK as a secondary investor in real estate funds and as a debt investor. The deal highlights the firm’s ambition to become a “more active direct real estate investor in the UK” according to a source. The deal, which is expected to exchange later this month, will conclude a long-running tussle to develop the site. Savills was originally appointed as selling agent in 2012 and an auction process led to the site being placed under offer by Orion Capital Managers and Quadrant Estates for around £33m in 2013. However the deal did not complete and the opportunity was relaunched to market by Savills and CBRE in autumn 2014. With prime rents in EC3 for non-tower floors now comfortably exceeding £60 per sq ft and forecast to rise further, the gross development value of the scheme could be well in excess of £300m. The improvement in the City office market together with the resolution of some outstanding rights of light issues helped push the bidding well above the previous sale price. 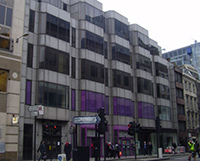 The site – which is occupied by several vacant buildings bounded by Fenchurch Street, Northumberland Alley, Carlisle Avenue and 90 Fenchurch Street – is held long leasehold from New College Oxford on a 250-year lease from 18 July 2012. Ground rent is £300,000pa and the initial gearing from practical completion of the scheme will be 4%. There is a license for demolition in place which will allow for an immediate start on site. The 15-storey Foster + Partners-designed scheme was originally consented in 2008 and was revised last year following a review by TP Bennett. It comprises two basement levels, ground, mezzanine and 14 upper floors, three with roof gardens. The building will be built with a steel frame and a Portland stone and glass façade.